Obviously the biggest aspect of matching an outdoor structure with your existing home is getting the color scheme right. Many people like to match the color of their vinyl structures with the color of their house, and this ensures a consistent, pleasant appearance. However, some people instead choose to make their vinyl structure the same color as their home’s trim or accents, or even to make it a complementary color (such as dark brown for a tan house). This can add some extra visual interest to the shade structure and give it more “weight” in the landscape. One of the chief benefits of working with vinyl is how easy it is to create custom shapes and designs to fit your exact specifications. 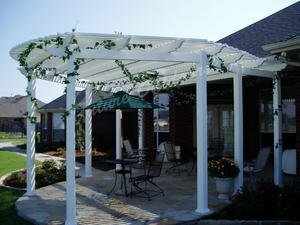 For instance, say you want a vinyl pergola for your back patio, but the design of the patio is curved or irregular. Instead of a straight-edged pergola that hangs out over the lawn, a vinyl pergola can be built to exactly match the curvature of your patio’s edges. The extreme customization that vinyl allows means almost any design is possible, and it also means you can get something that exactly matches the existing style and limits of your house. Many shade structures feature accents that add to their visual appeal or change their look significantly. These accents can be as simple as the railings or posts on a gazebo or the shingles on top of a cabana. In most cases, it’s good to try to match these accents with the design of existing accents on your home so they appear consistent. Look around the outside of your house for existing accented elements such as shutters, roof edges, columns, and railings for cues about how your shade structure should look. One thing many people don’t consider about their shade structure is that the size should be proportionate to the rest of their house. For a patio cover or attached structure this is easy, but standalone structures can often look too big or too small when compared to the home they’re next to. If you want your vinyl shade structure to look like it belongs in your backyard, consider how it will look when viewed alongside your house and whether it would look better if it were bigger or smaller. It can be tough to determine in advance whether or not an outdoor structure will “flow” well with the rest of the house, but there are a few ways you can help make sure your vinyl structure’s flow isn’t bad. For attached structures like patio covers, try to avoid placing pillars or posts in high-traffic areas or sight lines, and make sure the roof is high enough to keep it from feeling too enclosed. For standalone structures in the yard or apart from the house, think about how people will get to the structure – will there be a path or walkway? Also, make sure your shade structure feels comfortable and not crowded. You can look at our recent blog on creating a comfortable outdoor room for more tips on that. A vinyl shade structure can be a great way to make your backyard more livable and comfortable during the hot Texas summers. Plus, vinyl shade structures are durable enough to last for years without needing any maintenance or treatment. If you want to learn more about getting a quality vinyl shade structure for your Texas home, contact us today at Future Outdoors®. You can also visit our Facebook or Twitter pages to get more advice and read what others have to say about our products and service.